It's a hugely successful global cycling phenomenon, despite being open to all, with no structure, and little organised publicity. Originating as a single ride in San Francisco in 1992, it now has some kind of presence in hundreds of cities worldwide. Most participants now describe the rides as a celebration of cycling, though they have been described by the press as protests. 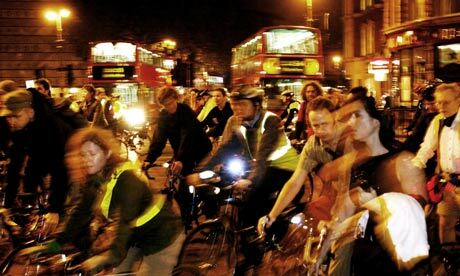 What is Critical Mass , and why do hundreds, if not thousands, of people still turn up every month in some very diverse cities? I attended the London Critical Mass ride last Friday to talk to the participants. Having been several times before, I had felt some division between the majority of riders who wanted to enjoy the ride, and a small number intent on arguing with motorists along the route. I regularly take part in group rides of various kinds, and am used to cyclists' enthusiasm. But I was overwhelmed by the extraordinary excitement that a short ride on a chilly evening had generated. For many, the ride was simply fun. There's a great atmosphere – it's a good social ride, they said. Most enjoyed the safety of riding in a large group, and this ride offers one of the few opportunities for doing that in central London. Some had political aims–- asserting the right to the road, and giving drivers a sense of what it's like to feel outnumbered were both mentioned – but the mood was overwhelmingly positive, and the enjoyment of group cycling palpable. One Italian cyclist was so overcome by the occasion that he described it as a celebration of London's "excellent cycle paths". Compared with Rome. He'd also composed a song for us all to sing. There was none of the anger I'd experienced on previous London Critical Mass rides, when the latter stages have become a running confrontation at junctions where traffic has been held back. The smaller numbers in November may have prevented this, but it also seems to me that the mood is changing, towards the celebration which the Critical Mass movement has wanted to be. Critical Mass models vary around the world. The Prague ride has become hugely popular by attracting families, and co-opting Police support: a mixture, perhaps, of London's Critical Mass and the Skyride. The newer Leicester ride is "a two-wheeled charm offensive" with a different theme and dress code every month. It appeals to riders (partly, at least) because of its celebratory atmosphere. The London ride has perhaps been influenced by the US Critical Mass rides, which have historically been the most confrontational. The relationship between London riders and the |police has in the past been fraught. In 2006, the Metropolitan police tried to declare the ride - which had until then been policed by them - illegal. Since losing that battle both initially and subsequently on appeal, the ride has operated independently. The court papers from the 2006 judgment reflect the changing attitudes of Critical Mass riders. They cite the aims of some participants then as "getting our own back at motorists" and "causing disruption." There was, of course, anger among London riders last Friday about the position of the British cyclist. Despite the rise in cycling over the past decade, there have not been adequate supporting changes in law, political attitudes or infrastructure. Though there is money for silly posters, blue paint and whitewash. However, as the Copenhagenize blogger Mikael Andersen argued in 2007, when calling for "Critical Manners" to replace the confrontational type of Critical Mass, cycling campaigners need to make cycling appeal to people who feel uncomfortable with the "often militant sub-culture" which dominated some Critical Mass rides four or five years ago. This person, a hypothetical "Mr Motorist", doesn't want to "climb onto a platform and become a visible statement-maker", but will only cycle if he "would blend in". Coming from Copenhagen, where more than 50% of journeys in the city centre are by bike, Anderson understands how to make cycling a thoroughly mainstream activity. Critical Mass doesn't now need to be a protest. Thanks to the very effective series of Blackfriars Flashrides and recent Tour Du Danger, we now have a model of how dedicated, constructive cycling protests can work. Both events diagnosed a problem precisely, and in the case of the Blackfriars rides, offered a detailed solution . There were no street-corner shouting matches to entrench negative stereotypes. The most popular and successful Critical Mass rides today, like Leicester , Budapest and Prague , explicitly rule out confrontation. 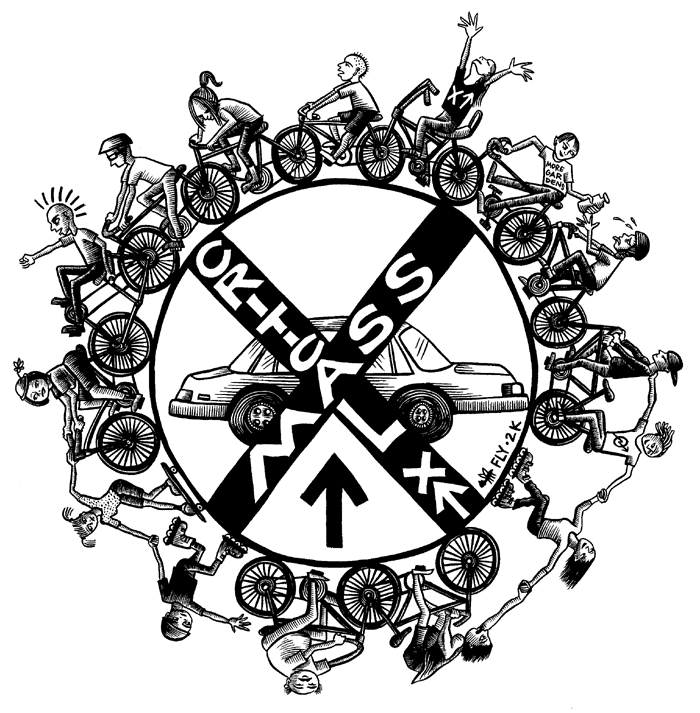 Critical Mass can offer something rather democratic, and in a way, more precious than protest. Unlike the atomised aggression created by an transport system of individual metal boxes, cycling in a group, in a shared space, makes people open and collaborative. As one cyclist said to me on Friday: "Cycling changes people's attitudes. It turns individuals into a community." An institute in America has tried to calculate the monetary and time value of traffic congestion – and says it costs the USA $101 billion a year. Por acaso tenho uma modelo Compy... é pesada mas potente. É já na próxima sexta feira que se realiza a 4ª Bicicletada do Barreiro. O local de concentracção é, como habitualmente, junto à estátua de Malangatana na rotunda norte do Fórum Barreiro, pelas 19h16m. Para os criticos da margem norte do Tejo que queiram participar, informamos que a Soflusa (barcos do Barreiro), transportam as biclas gratuitamente. Nas horas de ponta, das 17h30 às 20h00, este transporte está limitado a 2 biclas por barco. Esta condicionante só se coloca no sentido Lisboa - Barreiro, pois no sentido inverso são 5 biclas por barco. 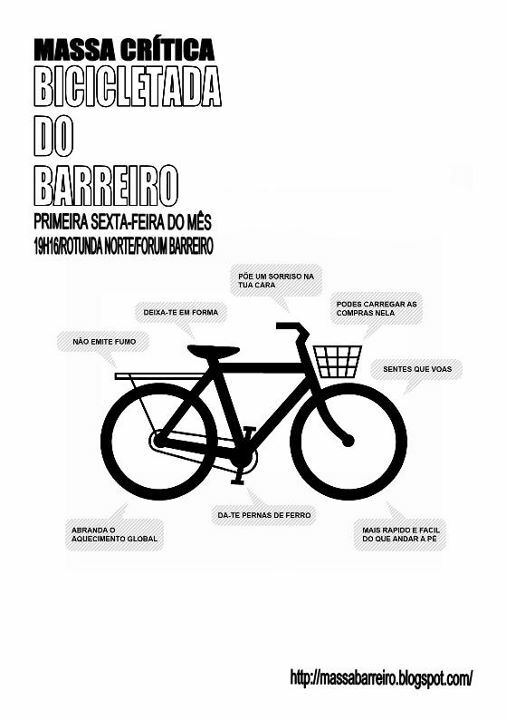 Contamos convosco para mais esta festa dedicada à bicicleta. Para quem quiser vir de Lisboa, a Soflusa faz transporte gratuíto de bicicletas. Como o percurso de Lisboa para o Barreiro é feito em Hora de Ponta (17h30/20h00), a lotação é de duas biclas por barco. No regresso já não se coloca esta condicionante. ISTO NÃO É UM EVENTO-Passeio no meio da cidade feito em transportes suaves. Realiza-se no Barreiro na primeira sexta-feira de cada mês às 19h16, partindo da rotunda norte do Forum Barreiro. Tinha preferencia por dinamos, e luzes ligadas.